DYMO DiscPainter For Discs And Only Discs | OhGizmo! While dedicated DVD and CD printers are far quicker and usually produce better results than an inkjet with disc-printing capabilities, they can be pretty expensive. 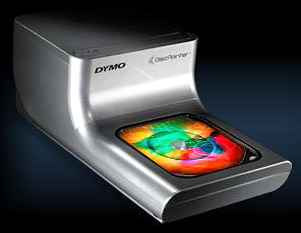 But the labeling empire known as DYMO feels that the average household could use a standalone disc printer and have created the DiscPainter to sell to the masses. But, if quality and speed aren’t that important to you the company has come up with another selling point they call RadialPrint technology. The best way to describe it is like that old Twirl-A-Paint toy, where the disc is printed from the inside edge to the outside edge while it spins. But instead of ending up with random smeared paint blotches, you get a high-quality finish. The DiscPainter also includes custom DYMO software for creating the label, but it can also be used with the standard design tools like Photoshop or Illustrator. With an expected retail price of about $279, if you only print the occasional disc you might be better off with an inkjet printer that includes this functionality. But if quality and speed are important, you’re not going to find a dedicated disc printer like this any cheaper. I recently purchased the DiscPainter and I love it! For years I used printable stickers and magic markers to put labels on my disks all of which were messy and produced “kid quality” results. My DiscPainter prints directly on the disk very fast (about a minute), with no mess, and no surprises. I was looking at an Epson printer to label CDs but I heard too many horror stories about the loading try being flimsy and jamming. I just don’t have the patience for gimmicks in my life. Tanya…don’t get teh epson b/c i have it and i am getting the dymo instead. those horro stories are not false. but i was looking inot this machine and it sounds great. inexpensive. great quality…whats not to love girl. My rate on this cd printer is 4.98 out of 5 because it is elegant and good when it comes to cd printing. That disc painter looks really great! It can print your CD's with ease. I also hear so many negative stories about this printer.